TORONTO: March 21, 2019 – “In order to offer riders a more convenient route and alleviate potential budget pressures on the Hurontario Light Rail Transit (LRT) project, changes to the scope of the project, recommended by Metrolinx, have been approved by the Government of Ontario. Metrolinx will continue to work with MTO and report back as the procurement process progresses. The changes have been designed to reduce project costs while still achieving the project goal of providing a fast, reliable and seamless customer experience between the new Hurontario LRT line, the GO Transit network, and the local transit systems. There are provisions in the contract language to adapt to future changes or additions to the LRT, including the completion of Mississauga’s City Centre loop and/or a potential extension into Brampton. The businesses of the Downtown Brampton BIA are excited to announce they are currently accepting proposals from local Brampton community organizations for both sponsorship and community partnership opportunities in 2019. This is a great opportunity for community organizations to connect with the downtown Brampton business district. In 2018 the DBBIA supported several organizations such as B-Jazzed, Live Art Competition, Thursday Night Concert Series, ARTBEAT and several more. 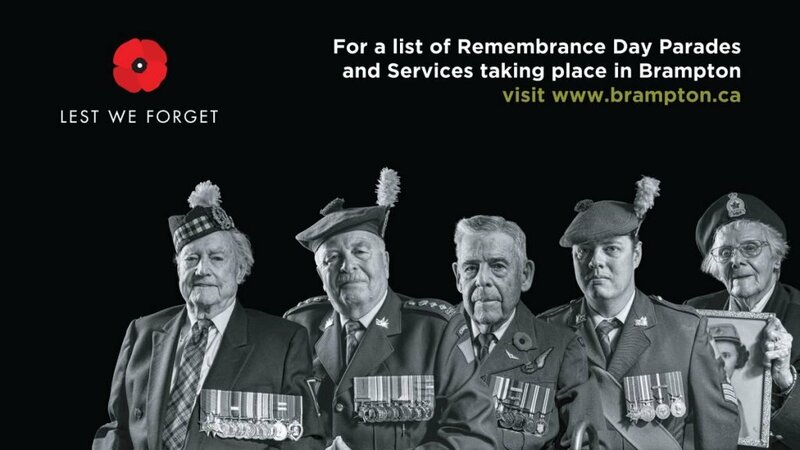 Tuesday, Oct 30 2018… BRAMPTON, ON – As part of Remembrance Day 2018, the City of Brampton and Royal Canadian Legion have events planned throughout the city. For a full list of event road closures, click here. A new initiative from the Royal Canadian Legion is the Bells of Peace. On November 11, communities across Canada will mark the 100th anniversary of the end of the First World War with the ringing of 100 bells. The ringing of bells emulates the moment in 1918 when church bells across Europe tolled as four years of war had come to an end. For more information, visit the Royal Canadian Legion’s website here. Brampton City Hall will be closed on Monday, November 12 in observance of Remembrance Day. As a result, a number of City services will be unavailable or will operate under reduced service levels. Residents will not be able to apply for marriage licenses, pay parking fines in person or apply for permits during this time. Online options for parking fines and building permits are available at www.brampton.ca. Several services will continue to operate normally, including Brampton Fire and Emergency Services and City of Brampton By-law Enforcement. Recreation centres will be operating normally. For more information on all City of Brampton service changes and closures please call 311 or visit www.brampton.ca. All branches of Brampton Library will be open on Sunday, November 11. In observance of Remembrance Day all branches will be closed on Monday, November 12. For more information, to place holds, or to browse our collections of books, music, online courses and more, visit bramptonlibrary.ca for 24-hour access, seven days a week, OR call 905.793.4636 ext. 74368.